Like the duck billed platypus, the long-beaked echidna is an egg-laying mammal, with variable body temperature like a reptile and other aspects that are bird-like, as described in the article. They forage at night, using their long snout to find bugs and worms not unlike an anteater. They have no predators nor do they bother anyone but the bugs and worms they eat. The long-beaked echidna, the short-beaked echidna and the duck-billed platypus, which together comprise the "monotremes," can live to more than fifty years, and they are the oldest surviving mammalian group. The long-billed echidnas, unliked their short-billed cousins which can be found in every Australian terrain, are found only in a remote area of New Guinnea rainforest, and the report outlined in the article is the first field study of the creature. Although the animals are so shy, the author of the scientific report, Muse Opiang, learned he could pick them up by grabbing them under the belly and they did not resist. "If you hold them against yourself they're friendly and they won't struggle," he said. If you wanted to push yourself to the outermost chalk line of human endurance, you might consider an ultramarathon, or a solo row across the Atlantic Ocean, or being nominated to the United States Supreme Court. Or you could try studying the long-beaked echidna, one of the oldest, rarest, shyest, silliest-looking yet potentially most illuminating mammals on earth. Muse Opiang was working as a field research officer when he became seized by a passion for the long-beaked echidna, or Zaglossus bartoni, which are found only in the tropical rain forests of New Guinea and a scattering of adjacent islands. He had seen them once or twice in captivity and in photographs — plump, terrier-size creatures abristle with so many competing notes of crane, mole, pig, turtle, tribble, Babar and boot scrubber that if they didn’t exist, nobody would think to Photoshop them. He knew that the mosaic effect was no mere sight gag: as one of just three surviving types of the group of primitive egg-laying mammals called monotremes, the long-beaked echidna is a genuine living link between reptiles and birds on one branch, and more familiar placental mammals like ourselves on the next. Mr. Opiang also knew that, whereas members of the two other monotreme genera, the duck-billed platypus and short-beaked echidna, had been studied for years — last May, the entire genetic code of the platypus was published to great fanfare — the life of the long-beaked echidna remained obscure and unsung. In a recent issue of The Journal of Mammalogy, Mr. Opiang offers the first glimpse of the natural history and ecology of an immaculately private nocturnalist with a surprisingly well-endowed brain. And while Mr. Opiang’s report shows that the doubters were technically wrong, the grueling details of his field methods suggest that as a workaday rule, “impossible to study” still suits Zaglossus quite well. The research and Mr. Opiang’s training were initially supported by the Wildlife Conservation Society of the Bronx Zoo, but Mr. Opiang, who pronounces his first name Moo-say and is now working on his doctorate through the University of Tasmania, has since cofounded his own organization, the Papua New Guinea Institute of Biological Research. Reproductively, monotremes are like a VCR-DVD unit, an embodiment of a technology in transition. They lay leathery eggs, as reptiles do, but then feed the so-called puggles that hatch with milk — though drizzled out of glands in the chest rather than expressed through nippled teats, and sometimes so enriched with iron that it looks pink. However they conduct their affairs, monotremes do it remarkably well. Not only are they the oldest surviving mammalian group, but individual monotremes can live 50 years or longer. 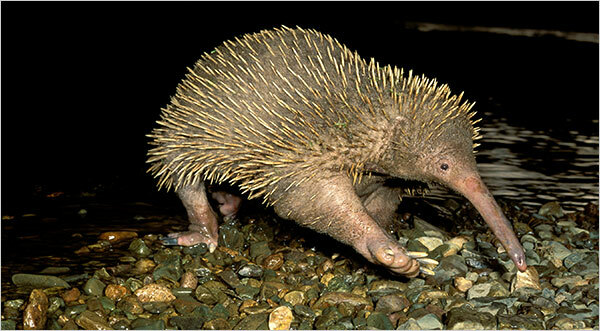 Peggy Rismiller of the University of Adelaide has studied the short-beaked echidna, or spiny anteater, since 1988. “One of the females we’ve been radiotracking since 1988 is at least 45, and she’s still reproducing,” Dr. Rismiller said. Dr. Rismiller also pointed out that short-beaked echidnas are Australia’s most widely distributed mammals, adapting to life in the desert, along on the coast, in the rain forest, up above the snowline, all the while feeding on any invertebrates they can disinter. Even in summer they maintain their internal body temperature at a temperate 88 degrees Fahrenheit, and on a winter night they may lapse into a torpor, their core body thermostat dropping down as low as 40 degrees — a cryogenic skill of interest to surgeons and space enthusiasts alike. Echidnas keep their cool, all right. “They’re one of the most pacifistic mammals,” Dr. Rismiller said. “Nobody bothers them; they don’t bother anybody. There’s a lot we could learn from them.” And in that level head sits a mighty brain. Among humans, the neocortex that allows us to reason and remember accounts for 30 percent of the brain; in echidnas, that figure is 50 percent. To reach them, you must hike for miles into the highlands, on treacherously steep and slippery terrain where it rains 275 inches a year. “It’s one of the wettest places on earth,” Dr. Wright said. That rain also wipes away signs of echidna foraging and denning. It took Mr. Opiang months of searching before he found his first echidna. Then he discovered that if he followed trails of freshly dug nose pokes at night — the holes that echidnas made with their beaks as they foraged for earthworms — he could find a den where a sated echidna would be hiding. He learned to grab them under the stomach, where there were no spines. “If you hold them against yourself, they’re friendly and they won’t struggle,” he said. Over five years he managed to capture, measure and, in most cases, attach radio transmitters to 22 individuals. Among his intriguing early findings: unlike most mammals, the females are bigger than the males, and the toothless, hairless tubular beaks through which they aim their ribbony tongues are longer, too. Once again, the long-beaked echidna pokes fun at all the rules.